The leader of the cheaters pack is Lance Armstrong right now. 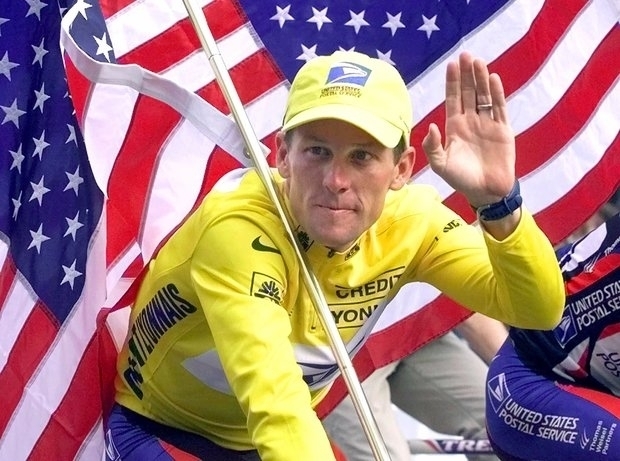 Lance Armstrong has the sports spotlight for cheating...for now. How many times has a sports headline screamed liar or cheat? As recently as last week, it was the Baseball Hall of Fame results that casted a bright spotlight on the ugliness of the steroid users. The baseball writers decided no one should be given the honor — even when there were worthy candidates that were untouched by performance enhancing drugs. This week the whole ugly and draining saga of cyclist Lance Armstrong has dominated headlines because of an interview with Oprah Winfrey. Armstrong decided to tell his story to Winfrey on her OWN network. Why? Who knows. The taping on Monday morning went two and a half hours, so there are two nights of viewing a man that lied and damaged many people along the way. It is hard to separate the multi-champion cyclist and the cancer fund raiser. He has millions of people torn over what he did. On the one hand, his endeavors raised millions of dollars for cancer research and buoyed the hopes of survivors because Armstrong was a man con brink of death. He used his personal tragedy and turned it into a multi-million dollar crusade to fight cancer. This is where there is a separation in my mind: he used that stage of empathy and rode his bike to unparalleled heights. But it was a lie. He doped his way to seven Tour De France victories and lashed out at people that questioned how he did it. And his endorsements brought him huge financial riches. It is difficult to decide which is worse: the lying or cheating? Both. In the world of sports, cheating has become more normal that I care to know. Major League Baseball turned a blind eye to steroid use. It filled the stands because it bolstered the offensive numbers. The players and the owners all made money and then the dirty secret became a public outing. Now there is testing. But there are still other means to get an advantage like human growth hormones. Don’t be fooled about football either, players figure out a way to cheat the system without getting caught. Some do get suspended, but the NFL and the fans don’t put a premium on the issue of performance enhancing drugs. The cheating and lying doesn’t have to be about drugs. Betting on baseball has kept the All-time hit leader Pete Rose out of the game. He lied and lied with stacks of evidence that proved he bet on baseball. Rose thumbed his nose at the investigation and game he dearly loved. He may have been forgiven and if he could have mustered up an apology in a timely manner. Initially, Tiger Woods’ problem was more of an issue for his wife. When it became a huge scandal publicly it destroyed a commercial image. His fall from grace affected the world of golf and his endorsement deals. Olympian Marion Jones lied about her steroid use and landed in prison on a perjury conviction. And nothing can more egregious than the Penn State cover up of Jerry Sandusky’s criminal actions. That is in a class all by itself and continues to have ramifications. Lance Armstrong and so many cyclists have been using drugs and knew how to get away with it for the most part. It was an epidemic in that world. Now Armstrong tells his story. Maybe he will be forgiven. In the world of sports, there are many opportunities for second chances. We may be adding another one, if the story about Notre Dame’s Manti Te&apos;o proves he was not a victim, but did the duping about his late imaginary girlfriend. It is unthinkable the lengths people will go to have an image they are desperate to portray and how gullible we are accepting it. If he was the victim, then it is another example of how low people go to exploit a sports personality. And another chapter of the ugly the world of sports will be written.